February 2018 - Senior Program Officer Eugene Tobin on the critical importance of the new Bard College and Brooklyn Library "microcollege." Across the country, libraries serve as great equalizers and safe spaces. They are institutions of change and models of equity and inclusion, allowing visitors free access to resources, irrespective of economic and social barriers. Bard at Brooklyn Public Library students have access to the Library’s many resources and inspiring spaces. I still remember the awe and pride I felt the first time I walked up the steps of our town’s public library. Even now, as I look at photographs of the Carnegie-funded Beaux Arts and Classical Revival style building, I can hear my parents’ voices saying that the library is “open to everyone.” An equally vivid memory is the clear sense of the differences in age, class, and race of the people who used the library. I suspect this diversity of experience and knowledge is one of the main reasons that libraries continue to play a central role in public and civic life. Across the country, libraries serve as great equalizers and safe spaces. They are institutions of change and models of equity and inclusion, allowing visitors free access to resources, irrespective of economic and social barriers. Findings from the Pew Research Center demonstrate that library goers use these spaces for a variety of educational, cultural, and workforce purposes, including taking early childhood, literacy, citizenship and high school equivalency classes, as well as matters related to job searches, personal finance, and access to technology. It is in this setting that Bard College, in collaboration with the Brooklyn Public Library, will soon launch its “microcollege,” the first ever accredited two-year associate’s degree program in a public library, which will provide nontraditional students with access to a quality tuition-free higher education. This is critically important, as one of the greatest barriers to economic mobility is the lack of a college degree. According to the Economic Policy Institute, since the Great Recession ended in 2009, college graduates have enjoyed pay gains, but non-graduates have seen an overall three percent decline in income. The Brooklyn Public Library, in particular, highlights the central role a public library can play in its community. Brooklyn, the increasingly diverse exemplar of all things hip, the heart of thriving musical, literary, and cultural movements, is also home to growing immigrant communities whose origins range from Africa and the West Indies to South Asia, and from Mexico and Central America to Eastern Europe. Approximately 37 percent of its 2.6 million residents were born outside the U.S. and 23 percent live below the poverty line. There is a compelling need in Brooklyn – and across the country – for programs that address the aspirations of vulnerable populations including immigrants, the homeless, veterans, formerly incarcerated people, and older adults. And it’s here in the Brooklyn Public Library’s Central Library that a majestic limestone Art Deco structure, designed to evoke an open book, receives more than 1.3 million visitors each year and items from its collections circulate nearly two million times annually. 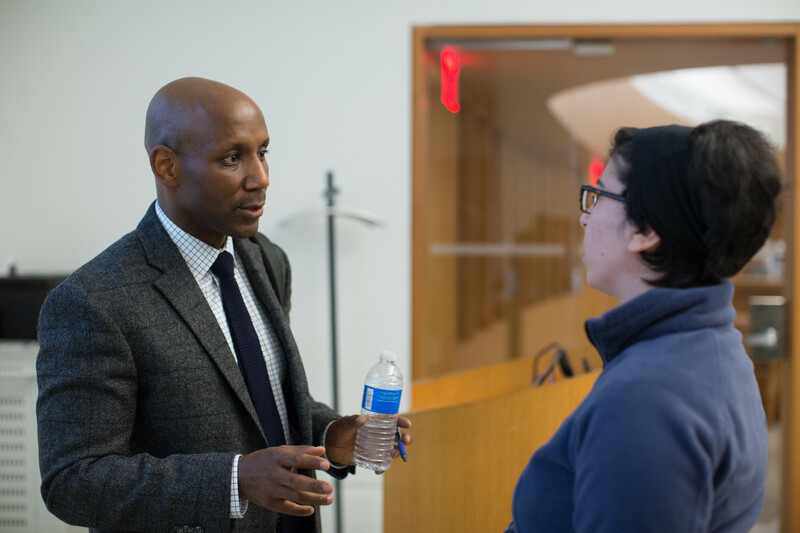 Professor Craig Wilder, Senior Fellow at BPI and Professor of History at MIT, speaks with a prospective student about the new microcollege. Target students at the microcollege will include local community members, many of whom have been too often discouraged or excluded from higher education due to socio-economic barriers, including formerly incarcerated people and the adult children and spouses of incarcerated individuals. For the next three years, through a selective and individualized admissions process supervised by Bard, including in-person writing sessions and personal interviews, approximately 32 students will be admitted to take small seminar courses in language and critical thinking, science writing, mathematics, and a slate of distribution courses. The Library will provide academic and social support systems, including counseling, research and referrals to educational, cultural, and community programs and services. Building on Bard’s highly successful and respected Prison Initiative program, the college will recruit and train the faculty, oversee the curriculum, and provide academic and tutorial support. There are two main take-aways to consider from this unique partnership. First, the microcollege encourages us to challenge conventional notions about how every American non-traditional student can gain access to a high quality college education. Second is the timely reminder that public libraries continue to be remarkably adaptable, nimble, and effective agencies of reinvention. Libraries are lifelines in the modern world. They provide access to knowledge and technology; they are places where people apply for jobs, file taxes, get warm during the winter, cool off in the summer, and escape the apprehension and frenzy of daily life. Few institutions have had as profound an impact on American society. Now, perhaps as a result of the Bard-Brooklyn Public Library partnership, these iconic institutions will become places where men and women who have been marginalized and left behind--immigrants, the homeless, veterans, the formerly incarcerated, and the family members of incarcerated people--can start their journeys toward a more secure future and a better life.